Time Out – I tried to keep working through the coma, the death, the wake and the funeral and I kept getting angrier and angrier that my clients did not recognize the sacrifice I was making on their behalf. As a self-employed trainer I also had some long-standing commitments that only I could fulfill and this was even harder than keeping my regularly scheduled classes going. So, this morning I decided to take some time out. I am attending training in Manchester this weekend, then visiting Glasgow for a friend’s wedding next Tuesday so I have cancelled my classes for the week. As it is half-term, everyone is getting a break from the classes for a week and I am getting some essential “me time.” I plan to do a little bit of soul-searching while I’m away so that I can come back to classes feeling refreshed and revitalized and ready for the weeks to come. I recommend that everyone take the opportunity for some time out when and where they can get it! Deep Breath – My Uncle died of lung cancer and this irony was not lost on me this week when I asked my clients to breathe deeply or took a deep breath myself. In fact, since last week, every time I take a conscious deep breath I thank the gods that my lungs are able to do this. Max Strom says that grief is stored in the lungs so I believe that breathing deeply and consciously will allow this grief to release which it has been doing through tears. I will continue to breathe deeply and let the tears flow until the pain of his death becomes less harsh and instead the joy of knowing him becomes part of me. I recommend that everyone take a moment to breathe deeply and feel the nervous system calming instantly. Dog Stretch – My all time, hands-down (!) favourite yoga posture! This has been my go-to pose for a long time as it stretches the whole body whilst simultaneously calming the nervous system. It is energising and relieves fatigue which is happening to me because of being so busy and yet not able to sleep well. I recommend everyone try downward facing dog wherever they are. If you cannot take your hands to the floor you can place them on the wall or a bench and take a puppy stretch instead. Please try out these 3 techniques and let me know in the comments if they helped you. And, if you have any other suggestions for dealing with grief I’d love to hear them! I did it! I found the loveliest guided relaxation script for my Beginners Yoga Class. 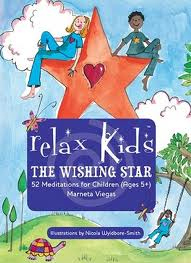 It is by Marneta Viegas of Relax Kids in her book The Wishing Star and, although it is designed for children aged 5+, it really appeals to people of all ages. So I have written it down below and included my own additions in square brackets. Try it and see… If you like it, I have copies of The Wishing Star available for sale so just let me know. Tomorrow it might just be some meditation for you! Pilates Instructor Manual FINALLY finished! I decided that I should treat myself the way I would want a good friend to be treated and I visited Nathalie Whan of Spa Serenity at Edenmore for a lovely back and shoulder massage. It made me think that I need to spend more quality time with myself and would appreciate some suggestions for other lovely things to do (nothing smutty, mind, I can come up with those things on my own!!). I sometimes forget that, as a self-employed yoga and Pilates instructor, my days are free to fill with lots of enjoyable activities. Instead I seem to have been filling them with house cleaning and administrative tasks and the quality time has got lost somewhere… So, please help!